Who are you guys, anyway? What makes Pearls International different? Pearls International is the best place to buy unique genuine pearl jewelry, gifts, and accessories online. We help our customers to think outside the round, white pearl by offering designs you won’t find anywhere else at affordable prices. We are family-owned and operated, and our passion is making our customers happy by providing products with superior quality and design. For years, the mission of the folks at Pearls International has been to bring our favorite obsession to the masses – Pearls! We believe that nature and artistic expression form two parts of a great whole: Nature provides the pearls, and our skilled craftsmen and artisans provide the artistic expression! The result is a finished product that is more than the sum of its parts. Our genuine unique and amazing pearl pieces will set your heart aflutter because they were designed to help you express your individual style and creativity! Pearls International is working hard to change the way business is conducted by making sustainability a part of every decision. We constantly strive to make our business more environmentally friendly, socially responsible, and just plain fun for your shopping pleasure! Made in the USA! The majority of our jewelry is made and assembled right in our own workshop here in Daytona Beach Shores. Some of the chains and jewelry components are imported. Occasionally, we will stock an item that was made elsewhere, but only if it is supremely awesome. Buying great jewelry has never been easier or more fun, thanks to the dedicated and growing team at our flagship store in Daytona Beach Shores, Florida. Our Pearls International Pearl Girls (and Guy) are always available to assist you with your jewelry needs. Meet our Pearl Team! We’d love to get to know you too. Call us at 386.767.3473, or email us at customercare@pearlsinternational.com. We’ll answer any of your questions and help you find the perfect piece. Pearls International. Be anything but ordinary. Where is Pearls International located? Pearls International is conveniently located in Daytona Beach Shores next to the beautiful Atlantic Ocean. Our store is one mile north of Dunlawton Ave. on Hwy A1A. Yes, and we’d love it if you’d stop by! We have a lovely showroom where you can view our beautiful jewelry creations. The address for our Daytona Beach Shores store is 3114 So. Atlantic Avenue, Daytona Beach Shores, FL 32118. We are open Tuesday – Friday 10am – 6pm, and Saturday 10am – 4pm. Stop in to look at all the pretties, watch a documentary about pearls, or sit down and try out the one-of-a-kind Pearls International Creation Station! We have a comfortable Gentleman’s Waiting Area complete with TV and sports magazines, so don’t be afraid to bring your other half along for the ride! Do you have the piece I’m looking at on the website in stock? Yes! All of the jewelry you see on the site is in stock at our store. You will never have to wait for us to order it for you from another source. If an item on the site is temporarily out of stock, you will not be able to add it to your cart. The only exception is for special order or custom items, which we make especially for you. 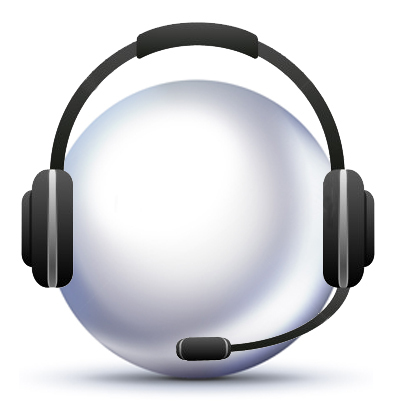 Call us at 386.767.3473 or email customercare@pearlsinternational.com if you have questions about a particular item. Can you help me select the perfect piece? Absolutely! Our expert Pearl Stylists can give you tips, tricks, and all sorts of great ideas for pairing jewelry to create the perfect outfit. Find out more about our FREE Personal Shopper service here! Yes, we have a one-year warranty on the workmanship of all our jewelry in addition to our 30-day satisfaction guarantee return policy. If you accidentally damage a piece, we’ll be happy to repair it for you for a reasonable fee. The warranty is void if the piece is altered or another jeweler resizes or modifies the piece, since alterations, when done incorrectly, can damage the pearls or the strength of the setting. Does Pearls International have a catalog? We do not carry a printed catalog for the flagship store, rather, our catalog is online at pearlsinternational.com. Virtually all of our shop items appear right here on our website! Benefits for having an account include: 1. Access to your order history. 2. Quicker check out, since you don’t have to re-enter your shipping information. 3. Password- protect your Wish List and access it from anywhere. 4. Opportunity to receive exclusive offers, discounts, and more from Pearls International. Why should I subscribe to your seasonal newsletter? Subscribers see new Pearls International designs first, sometimes even before they are available on our website. We report on the latest jewelry trends every season, what the stars are wearing, and tips and tricks for making the most of your pearls. You can also opt-in to receive occasional special offers and coupons. We’ll never send you spam, because we hate it too. Subscribe to our seasonal newsletter here and get 10% off your next purchase! We occasionally send our subscribers special offers and coupons in return for their opinions on new collections. Check back often to take advantage of website-wide sales and discounts! Yes. Pearls International Gift Cards and Certificates allow you to give a special person in your life a beautiful, heirloom quality gift. You have a choice of either an Instant Electronic Gift Certificate that is sent to your recipient via email (great if you’re on a deadline! ), or a Pearls International Gift Card sent to you via U.S. mail. You can select the amount to place on the Gift Card and be sure that your special someone will absolutely adore their one-of-a-kind gift! You can access and update any information pertaining to your account. To access your account, click here. Once you login to your account, click the ‘Edit Profile’ button to change your email address. I can’t find the piece I wanted on the site anymore. Can I still order it? We do occasionally update our selection and remove pieces we no longer offer. We also rotate prominently featured items. It may be that the piece you are looking for is still available, but in a different location. Call Pearls International Customer Care at 386.767.3473 or email us at customercare@pearlsinternational.com and we’ll do our best to find it for you. Why did the price change on the piece I’ve been planning to purchase? Can I lock in the price now? At Pearls International, we always want to give you the best possible price. Our prices change as the prices of pearls and precious metals fluctuate. If you would like to freeze today’s price for two weeks, email us at customercare@pearlsinternational.com or call Customer Care at 386.767.3473. You’ll be able to purchase the item at your reserved price by contacting us when you are ready to purchase. (You can also decide to buy the item at the future price if you prefer, it’s up to you.) We cannot offer price reservations on special order or custom jewelry, sale items, or last minute gifts, as these jewelry categories are subject to availability. I saw a Pearls International item on another shopping site and the price was different. Why is that? All our pricing is calculated using current metal and gem prices to give you the best possible value. When these prices fluctuate we adjust our pricing to accommodate the changes from our suppliers. Of course, not all shopping sites adjust their pricing at the same times, so price changes may not be immediately reflected. For items that are more than $1,000, we are happy to provide a retail replacement evaluation of your jewelry piece for your insurance company. Call Pearls International Customer Care at 386.767.3473 or email us at customercare@pearlsinternational.com for more information. How can I keep track of new developments at Pearls International? There are tons of great ways to keep track of what we’re up to. Check out Pearly Whirly, the official blog of Pearls International, follow us on Facebook, Twitter, or Pinterest, and sign up for our seasonal email newsletter, Pearls’ Eye View! You can also opt-in to receive occasional discounts and offers, and even get great deals sent to you on your birthday and anniversary! Currently we offer free shipping for orders over $99. Some expedited delivery requests may require an additional charge. A full list of our shipping rates is available here. We do not ship to other countries at this time. If you live overseas or would like to send a gift to a friend in another country, we would be happy to send your purchase to your USA-based forwarding agent. Yes! If you signed up for an account with Pearls International, you can view the status of your purchases by logging in to your account. We will also provide tracking information if you give us a valid email address at the time you place your order. I have an occasion coming up soon, can I get my jewelry faster? We do our best to make people happy with our beautiful pearls. Call Customer Care at 386.767.3473 to request special express delivery and we’ll do it if we can. It may require overnight delivery or Saturday delivery, both of which are offered at an additional charge. View our shipping rates here. Yes, but only through U.S. Mail. FedEx does not deliver to PO boxes. You can elect to insure your package for an additional fee. A receiving signature is required on delivery of orders over $1,000. (If your package is below $1,000 but you’d like a signature to be required, just let us know.) You’ll receive an email that the package is on its way. Call us before we send it to make special delivery arrangements. Pearls International offers a money-back 30-day return policy. You can send pieces in their original condition back for a full refund: it’s that simple. All you pay is the return shipping! To make your holiday shopping stress free, all orders placed after November 11 will be returnable until January 15. Please see our Shipping and Returns page for details. Simply give Pearls International Customer Care a call at 386.767.3473 and we’ll walk you through the simple process. Can I return a special order or custom item? No. Special order and custom items are non-returnable. After we have received and inspected your returned order, we issue your credit within 24-48 hours. It then depends on your card issuer how long it takes to appear in your account. Of course! Our custom design specialists will be happy to collaborate with you on any design your heart desires! You can learn more about our custom design services and see examples of our work here. Can I order a design with a different size or shape of pearl? Some designs are available with different size or shape pearls or we may carry something almost the same in the size and shape you want. Call Pearls International Customer Care at 386.767.3473 and we’ll help you find the perfect piece! Do you buy gold, gemstones, or pearls? We do not as a rule buy estate, pawn, or used jewelry, gemstones or pearls. Can I order a ring in a size that isn’t offered on the site? Yes. There may be an additional charge depending on the size and the metal components. Special-order sized rings are nonreturnable. Contact Customer Care at 386.767.3473 for details or check out our Resizing Policy. Yes. We can send you photos of chains that are available from our suppliers. Just call Contact Customer Care at 386.767.3473 and let us know if you are looking for something specific. Are the metals used in your jewelry products guaranteed not to tarnish? Even though the jewelry from Pearls International is made from the finest materials and with the greatest attention to detail, it can still tarnish. As with all jewelry, you should treat your items with care. Jewelry should be stored inside a jewelry box or bag to minimize the need for cleaning. Due to numerous individual and/or external factors, metals will tarnish or oxidize when not worn and if exposed to air, whether they are gold plated, silver plated, gold filled, 14K gold, sterling silver, brass, copper, or any of the other “non- tarnishing” metals used in the manufacture of jewelry. Environmental and personal usage of cosmetics, cleansers, and household chemicals are the dominating causes of metal tarnish. Our company stands behind all of our materials and workmanship, but unfortunately, we cannot guarantee against tarnish or wear and tear. What do the terms “gold tone” and “silver tone” mean? “Gold tone” and “Silver tone”, is reference to a plating process where the base metal of the indicated item has been plated with an overlaying metal to give it the gold or silver color. This plating process applies a thin layer of the desired metal color through an electrolysis process. Over time, this plated material, as with all jewelry metals, will tend to tarnish, and with heavy wear, will begin to wear through to the underlying base metal. Yes. All silver eventually does tarnish. How long it will take depends on the chemistry of your skin and whether you live near the ocean. The good news? The more you wear it, the longer it will take to tarnish. (We love any excuse for wearing more jewelry more often!). Just be careful what cleaning products you use to remove tarnish, since some of them can damage the luster of pearls. View the Pearl Care section of these FAQs for more details. We do everything we can to use environmentally sustainable practices in our business, but some findings like earring posts and chains are not currently available with recycled metals, and it sometimes difficult to determine the origin of the metal. We continue to work with our suppliers toward a future of 100% traceable precious metals. What if I don’t know the ring size? You can download and print a free paper ring sizer here. If time is of the essence, or you are purchasing the ring as a gift, choose “not sure” from the ring size drop down and proceed to checkout. We will contact you to help. Pearls International offers one free resizing within 30 days of delivery on eligible pieces. All you have to pay is the shipping. However, resizing can take three to six weeks and we know you won’t want to be without your ring for that long: we’d love to help you get it right the first time! For special requests such as this, it is best to contact us for more information. While we normally sell finished pieces only, we may be able to fashion you an identical ring with no stone with our custom design services. Also, it is usually possible to use your own stones in a setting we have in stock. You can also find many blank settings for rings and more on our extended inventory Showcase here. Please feel free to call 386.767.3473 for ordering information! What countries do pearls usually come from? Australia, China, Japan, and Tahiti. What are the four largest groupings of pearls? What is the difference between Freshwater pearls and Akoya pearls? Freshwater pearls are recognized as the most varied and beautifully cultured pearls in the world. They are most often cultivated in pristine freshwater lakes in China as well as Japan. Freshwater pearls come in every size, shape and color. “Akoya” refers to pearls produced by the Japanese Akoya oyster (Pinctada Fucata martensii) that lives in the ocean waters off the coasts of Japan and China. Akoyas are usually a round, flat shell and usually come in shades of white with rainbow interiors. What is the difference between Black Tahitian pearls and South Sea pearls? Black Tahitian pearls and South Sea pearls are named according to the location where they are cultivated. Both of these groups generally come in all shades of gray to black. They are usually cultivated to be round, but sometimes come in irregular shapes. South Sea pearls are often found in white and gold, as well. Following the pattern set by Nature herself, an irritant in the form of a mother-of-pearl bead or small piece of the mantle of another type of mollusk is slipped within the folds of a live oyster or clam. 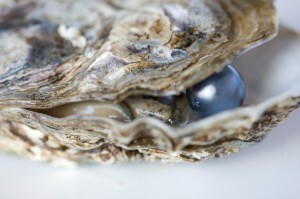 The mollusk is then returned to the water and in time covers the bead with layers of nacre, the pearl substance. At the end of the prescribed period, the mollusks are taken out and the pearls removed. The oyster is then implanted with another bead or piece of mantle and again returned to the water. Mother-of-pearl, also called nacre, is a natural iridescent layer of material which forms in the shell lining of many mollusks. Pearl oysters and abalone are both sources of mother of pearl, which is widely used as an inlay in jewelry, furniture, and musical instruments. Mother-of-pearl comes in several natural colors, and is often bleached and dyed for decorative use. The dye retains the shimmering layers of nacre which make Mother-of- Pearl so sought after. Virtually all pearls on the pearl market today are cultured. The rarity of natural pearls places them beyond the reach of the average consumer. Pearls International pearls are hand- selected by our expert Pearl Specialists to create stunning designs from nature. Are all of your pearls real? Yes. We’re in the business of making heirlooms. We don’t want to be pearl snobs but we’d like to point out that instead of something that’s made in a factory, you may choose a beautiful natural gemstone that has lasting value for not much more! You’ll thank us later! What quality are your pearls? Pearls International offers only high quality pearls with exceptional luster and shine. We select premium pearls in hundreds of varieties to provide designs that will complement every style. Can I get an authenticity certificate for my pearls? Yes. All of our pearl pieces are accompanied by a card stating their authenticity. If you require a grading certificate, please contact Customer Care at 386.767.3473 or email us at customercare@pearlsinternational.com. Some varieties of pearls are enhanced in color and in luster. At Pearls International, we carry a huge variety of un-enhanced pearls along with some that are just too pretty to pass up! If you prefer unenhanced pearls in a rare or unusual color, please contact us and we will do our best to accommodate your needs. Our Pearl Specialists seek out the best pearls available a variety of sizes, shapes, and colors from around the world. Most pearls come from China, Japan, Tahiti, Indonesia, Australia, and New Zealand, and we occasionally see pearls from sources closer to home, like Tennessee! Some varieties, like Akoyas, are produced in only one locality and others, like freshwater pearls, come from several different places. We have all the details on each variety (and much more) in our Pearl Library. We would be happy to give you more details about a specific pearl variety if you just ask. Let us know the size and shape of the pearls you are interested in since that may sometimes determine origin. Also if you would like to purchase a pearl from a particular place, we will find one for you. But we would urge you not to assume that origin and quality are the same thing. Sometimes the most beautiful pearls come from the most unlikely oysters! It is not always possible to tell where a pearl originates after it has been sorted and polished. At Pearls International we choose our suppliers carefully and do our best to assure that all the gemstones we sell are responsibly cultivated. We support high ethical standards in the pearl and jewelry industry. We can set gemstones only if you bring them to the store in person. Our experts can look at them and determine exactly what can be done with your gems. All sales prices are final and Pearls International does not price match. All our pricing is calculated using current precious metal and pearl prices to give you the best possible value. These prices do change from time to time which causes our prices to fluctuate accordingly. What happens if the ring I bought doesn’t fit? Pearls International offers one discounted resizing within 30 days of delivery. All you have to pay is the shipping. Resizing can take one to six weeks depending on the style, seasonal order load, and shipping. Some styles may not be able to be resized: we’ll let you know before we complete your order. Check out our Resizing Policy for details. Pearls International offers a free one-year warranty on every purchase. If there are any problems with the quality of the workmanship of your piece we’ll repair or replace it free of charge. If you damage a piece, we’ll repair it for you for a very reasonable fee plus shipping: we want you to enjoy your piece, not have it sitting in a box! You may opt to have your local jeweler resize your ring, however, if a piece has been altered in any way, we cannot accept a return or exchange and the one-year warranty becomes void. How can I keep my jewelry looking beautiful? Pearls are very easy to care for. With the right technique, your Pearls International jewelry will look amazing for generations. Pearls’ worst enemy is chlorine. Repeated exposure can weaken its structure, eventually leading to chipping. Try to keep your pearls away from chlorinated cleaning products, swimming pools and Jacuzzis. For maintenance cleaning, use lukewarm, soapy water. Rinse with clear water, then dry and polish with a soft cloth. Lay out flat to dry for at least 24 hours. For occasional deep cleaning, liquid cleaners such as ordinary household ammonia and products made especially for cleaning jewelry will not harm pearls unless specifically listed in the product instructions. Avoid cleaning pearls with abrasive products or cloths as these items will have a tendency to scratch or dull the pearls. Dipping your jewelry in a bath of ordinary household ammonia for about 30-45 seconds, followed by a light scrubbing with a soft tooth brush, then thoroughly rinsing in warm running water will remove built up dirt and oils and should return metal to its original color. Avoid rubbing plated materials with abrasive compounds or cloths as this will have the tendency to remove the plating. Tip: Put your pearls on after you have used your hair spray, not before. Hair spray can build up a sticky residue on your pearl jewelry and cause it to become dull. However, you can clean hairspray off of your pearls using the above method. If you want to be absolutely sure that the products you use won’t harm your pearls, we offer specially formulated Pearls International Pearl Juice and special polishing cloths that are guaranteed not to damage your pearls. What is a Pearl Party? A Pearl Party is a unique way to get free Pearls International jewelry. Host a party in your home or office — you provide the guests, we’ll bring the pearls! What Pearl Perks are available? Hostesses will receive 15% off their total purchase for qualifying parties, in addition to great hostess gifts and insider discounts! How do I schedule a Pearl Party? Call the Pearls International Pearl Girls at 386.767.3473 to schedule your Pearl Party today! Are Pearl Parties offered in my hometown? Currently, Pearl Parties are available only for locations in central Florida, but we are expanding! Check back often for updates! Currently, we accept Master Card, Visa, American Express, and Discover Card. For all payment methods, you will be charged when you place your order. You can also send us a check: just call Customer Care at 386.767.3473 and we’ll place the order for you. Do you accept Cashier’s Checks or Money Orders? Yes, we accept cashier’s checks and money orders. Sales tax at six and one-half percent (6.5%) will be added to all orders originated in Florida. Orders originating in states other than Florida are taxed at zero percent (0%) if the order comes in via the telephone or the website. Do you have layaway plans? Yes, we do! Layaway is available by phone order or in-store purchase only. For an item to be placed on hold, we require a 20% down payment. Layaway items can be held for up to six months. For more information on our layaway policy, click here. A cookie, also known as a web cookie, browser cookie, and HTTP cookie, is a piece of text stored by a user’s web browser. A cookie can be used for authentication, storing site preferences, shopping cart contents, the identifier for a server-based session, or anything else that can be accomplished through storing text data. You need to enable cookies to be able to add a specific product to cart and to checkout from there on. Pearls International is always looking for new talent to add to our growing team! Check out our Careers page for more details. If I have questions that are not covered in the FAQs, who may I contact? For answers to other questions, feel free to call Customer Care at 386.767.3473 or email us at customercare@pearlsinternational.com!